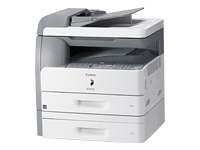 Added intelligence helps the iR1024iF stand out as a multifunctional printer with real power. Copy beefy reports with the document feeder, print double side presentations in black and white, send faxes, or scan and send in color directly from your desk - all at a swift 24 pages per minute. Add an energy saving mode with instant recovery and you have the ideal solution for home offices or small business needing intelligent, deadline-beating performance. When you have large documents to copy it's great to have the flexibility to do it at your desk and in no time. Thanks to the built in document feeder and electronic sorting, you can leave it to the iR1024iF to get the job done with no fuss. Communication skills are enhanced by the intelligent send capabilities of the iR1024iF. Documents can be scanned in color via the document feeder and then sent directly to email addresses - a real time saver where quick decisions help your bottom line.